Have you been yearning for a tropical vacation? Do you find yourself day dreaming of sand between your toes, a salty ocean breeze and long days with nothing to do but lie on the beach with a cold drink by your side? If so, it’s time for you to book a stay at Zoëtry Wellness & Spa Resorts! Until then, this delicious and delightfully good-for-you smoothie will make you feel a little closer to paradise. Many visitors to Zoëtry comment on how much they enjoy both the quality of fruit we’re able to offer. This smoothie contains fresh mango along with a secret ingredient sure to transport you to the tropics: avocado. Avocados, rich in healthy monounsaturated fat, fiber, potassium, vitamin E and more have countless touted benefits. In a smoothie, avocado also lends a rich and creamy feel. Check out the tasty recipe from of Reader’s Digest below. Have you ever tried avocados in your smoothie? Give it a try! 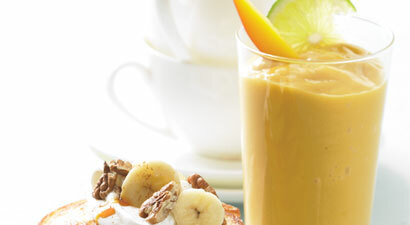 In a blender, combine the chopped mango, avocado, sorbet, milk, honey, lime juice, and ice. Blend on high until smooth. Pour into a tall glass. Slit the sliced mango and the sliced lime halfway through to the centers. Attach them to the rim of the glass before serving. This entry was posted in Zoëtry Wellness & Spa Resorts and tagged #zoetry, Avocado, Avocados, healthy smoothie, mango, smoothie, smoothies, Zoetry Wellness Spas & Resorts. Bookmark the permalink.